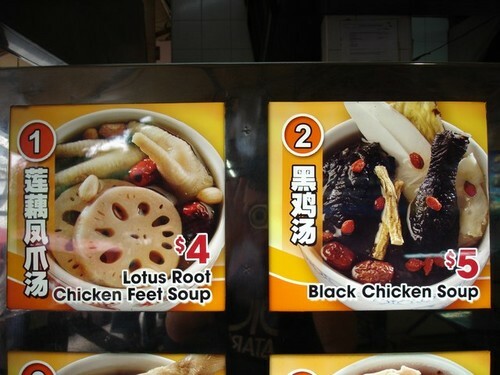 singapore has many top notch restaurants. it’s filled w/ super shwanky places that are crazy expensive but at the same time, one of the really poplar ways to eat is by going to one of the many food courts around town. these foodcourts aren’t packed full of fast food chains and other chains like back home, instead they serve very authentic food in a humble outdoor cafeteria-like setting. most of this food is chinese w/ some indian and malaysian eateries thrown in. but, this chinese food isn’t like the chinese food we all know and love back home…. nice tender chunks of meat cooked in a variety of tangy sauces. nooooo. not at all. the food here instead has all sorts or random hunks fo meet: feet, organs, bones, fat, fish heads, brains, etc etc. this wide and random assortment of meats is then often mixed w/ random odd unidentifiable spices, pungent thick pastes, odd smelling broths, etc etc. in other words, everything around is sort of familiar… but quite strange at the same time. today, caryn and i wandered around one of these food courts for a while and had a really hard time trying to decide what to get. finally we got some “laksa” which is a malaysian coconut curry and this weird burrito-looking thing. neither of them turned out too great. *sigh*. we fondly looked back on yesterday, when our food court experience consisted of gyoza and an interesting red-bean pastry… both of which were really good. well, i guess you can’t win them all. afterwards, we got some “desert”. i put quotes around desert, cause it can only loosely be described as such. 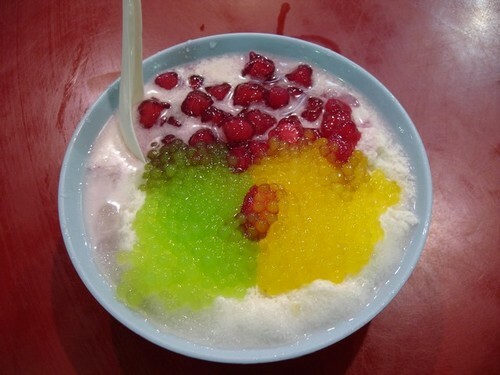 i got something called “ruby red w/ sago”. i had no clue what sago was, but i assumed that ruby red would be grapefruit. wrong! ruby red turned out to be these weird candied red gelatinous balls w/ chunks of something inside (maybe coconut?). these red balls, were mixed w/ smaller balls which came in both green and yellow and the whole thing was dumped onto a huge snowcone type thing in a bowl that had some milk poured over it. although quite a bizarre concoction, it actually tasted pretty good. in fact, if i hadn’t been so shocked by the way it looked, it may have been more than just “pretty good”. if i thought my desert was weird, caryn’s was way weirder. she got something called “logan w/ 8 treasures”. same deal w/ the shaved ice and stuff on top. but the stuff on top, the “8 treasures”, were: figs, garbanzo beans, kidney beans, white fungus, dates, ginko seeds, and a few other unidentifiable things. so weird… it really didnt seem desert-like at all!! Caryn is brave. I’m not sure I’d eat anything called “logan w/ 8 treasures”. 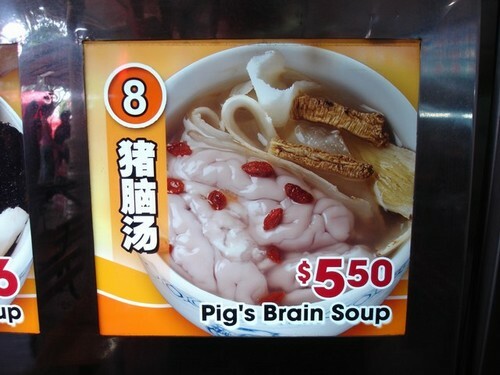 Hey can you send me some pig’s brain soup? It looks AWESOME! 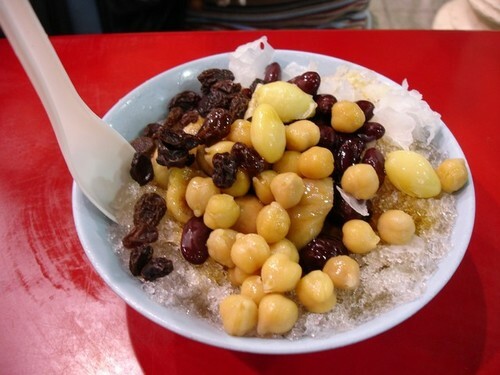 I went out with a Korean friend a few weeks ago and we had that shaved ice dessert with red bean. It was okay but not amazing. I didn’t see that in China at all but this was at a Korean cafe. ahhhh. chestnut.. that makes sense. yeah, the food is really funky.. but i could see someone getting into it. i dont have to send it to ya.. just make some at home!